Ann's Genealogy - Journey With My Ancestors from their Homelands through the States! Click on Graphic to go to site! JOBE LEGACY -9 Generations of Andrew Job, Jr.
Rootsweb Message Boards - MY POSTINGS! FTM Bulletin Boards (Old Genforum) - MY POSTINGS! After Isaac JOBE, was killed at the Battle of New Orleans in 1815, his sons,(Isaac, Eli B., Samuel, and Caleb) JOBE settled on Eleven Point River; establishing JOBE Township, present-day Oregon Co., MO near Myrtle. Due to county boundaries changing, they can be found in several counties in this area. Eliza Ann SMITH - DOES ANYONE KNOW HER PARENTS ???? 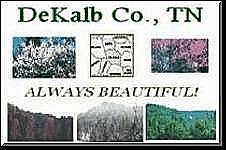 Researching any family in DEKALB COUNTY -- E-mail ME!! I HAVE A HUGE DATABASE FOR THIS COUNTY! Edward Elms KENDALL m/l Nancy ? William WRIGHT and Frances CAMPBELL descenants! My Jobe Page of Links!! Don't Forget - SIGN my guestbook! WRITE ME by clicking on link beside raining doll above! Always Searching for new cousins! Thanks for stopping by. You are my visitor to drop by.